ACAT credentials are prestigious certifications,that demonstrate your commitment to continuing education, ethics, and knowledge, to your clients. 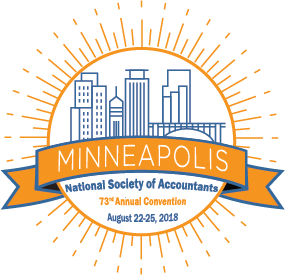 The Accreditation Council for Accountancy and Taxation® (ACAT) will be offering proctored exams for the Accredited Business Accountant/Advisor (ABA), Accredited Retirement Advisor (ARA), and the Accredited Tax Preparer (ATP) credentials prior to the NSA’s Annual Convention in Minneapolis. 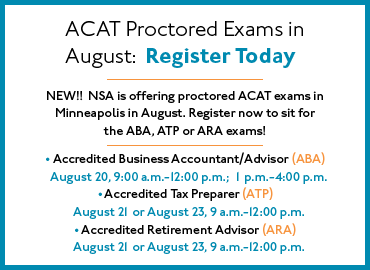 ACAT is also offering a live review for the ATP in conjunction with the NSA’s Enrolled Agent review course on August 20th. ACAT credentials are prestigious certifications, exhibiting commitment to continuing education, ethics, and knowledge. After developing a new and improved exam, this credential is once again available for certification. The ARA credential recognizes professionals who have a thorough knowledge of topics relevant to retirement planning and special issues of senior citizens including tax planning and tax preparation for decedents, estates, and trusts; and applying your knowledge and skills in real-life situations when serving aging clients. The ABA is a high-level credential that tests the technical proficiency of accounting and tax professionals in financial accounting, financial reporting, financial statement preparation, taxation, business consulting services, business law and ethics. Emphasis is on a practical approach to public accounting. To become an ABA, candidates must pass the Comprehensive Examination for Accreditation in Accountancy and have three years of related work experience, up to two of which may be satisfied through college credit. In Iowa and Minnesota achieving the ABA designation meets state regulatory requirements to practice public accountancy. The exam is divided into two parts: Practice 1 and Practice 2. Practice 1 covers financial accounting and financial statement preparation, presentation and reporting. Practice 2 covers the taxation, business law, business accounting and ethics. The ATP is a leading national credential for tax practitioners who have a thorough knowledge of the existing tax code and the preparation of individual tax returns with an expertise in comprehensive 1040 issues including supporting schedules, self-employed returns, and ethics. To become an Accredited Tax Preparer, candidates must pass the 100-question ATP exam. Accredited Tax Preparers (ATP) and Accredited Business Accountant/Advisors (ABA) are exempt from taking the Annual Federal Tax Refresher (AFTR) course and exam that is part of the Internal Revenue Service (IRS) voluntary Annual Filing Season Program (AFSP) and automatically qualify for the IRS Annual Filing Season Program Record of Completion. ATPs and ABAs who are Annual Filing Season Program (AFSP) Record of Completion Holders are included in the IRS public directory of tax return preparers and have limited representation rights, meaning they can represent clients whose returns they prepared and signed, but only before revenue agents, customer service representatives, and similar IRS employees, including the Taxpayer Advocate Service.